N81 (+ Bose QC3) = Musical Bliss! I do not have words to describe what I feel. I am supposed to be working on something very important right now, yet I simply cannot get myself to do that! For last one week, I’ve heard more music than I usually listen to in months. I am addicted, its that bad! The N81 8GB special edition ships with Bose Quiet Comfort 3 noise cancelling headphones in addition to the usual accessories that come with the device. This changes the equation completely. It took me an hour or so to set up the N81 8GB for use as my primary device and then a two hour charge for the headphone’s battery and I was good to go. But before that I’ll give you a little background. I have been using my N95 as my primary device for long and it performs reasonably as a music player but for me it was never in the N91 league. The N91 was by far the best music phone ever made and I enjoyed my time with it. It has taken Nokia quite some time coming out with a ‘true’ successor I hoped that with the N81 they had made the wait worthwhile. Once the N81 was out of the beautiful packaging, I got a little bit of my music across via wifi using the Home Media application and got out the default headphones (same as the ones that ship with the N95). Since the N81 is a music centric device my expectations were high. Once I played a track at 75% volume my reaction was mixed. While the music did sound nice the depth in the sound and bass wasn’t upto the high standard I had set(Earphone’s Fault). However it was better than the out of the box experience of any other Nseries except the N91. Traditionally Nseries phones come with the equaliser set on default and quite frankly it takes the fizz out of the music. So I looked it up to crank it to my liking, and Nokia had me surprised! The N81 is an out and out music phone, yet it has a 5 band equaliser with the same presets as the N95 which unlike the N81 has an 8 band set. The N91 also had an 8 band set and much better presets. Although I not sure if it will make a lot of difference but for a device such as the N81, I think Nokia has missed a trick. As always the presets do not always produce the best music so I made one of my own. The music for me sounds much better now, the exact config that gives you the kind of output you like may vary. I still maintain that the N91 headphones are the best Nokia ever shipped. There was a world of difference with the N81 producing music comparable to the N91. While N91 is still a little more loud, the audio quality on the N81 makes for great listening. The iPod default headphones also make the N81 sound way better and the reason I tried them is because these days almost everyone these days has an iPod and thus makes for better comparison. Lets get the N95 out of the way first. The music quality is a little better when you are using the default headphones, however with any other good headphone the difference is very noticeable. The iPod is something I have never liked, but I’ll try and keep the prejudice out of the way. The iPod was much louder and with original earphones on both devices, beats the N81 easily. But the equation changes as soon as a better headphone comes into the picture and because of the greater flexibilty(bluetooth, sync to any computer etc) the N81 takes this round. The audio quality comes very close. As far the comparisons with the N91 are concerned, I still maintain it is the best music phone, ever. The out of box experience on the N81 is partly to blame for that. Nokia has to start bundling in better earphones. I somehow wonder why is Nokia not making another N91!? They give the N81 a smaller equaliser and a little less volume even when it is an out and out music phone, why? The noise cancelling headphones have been constructed in such a way that they have a tiny microphone on each side that detects outside noise before it enters your ears. Then the noise cancellation circuitry does its magic by inverting the captured signal and merges it with what you are listening to, thereby canceling most of the noise created in the area and thus making music sound better. As soon as these headphones step in, it becomes the moment of glory for the N81, and for me, the N81 takes the crown as the best music phone. Yes, the N91 and the iPod have a little more volume, but the N81 has better depth and a sweetness to its music that makes it click for me. I have hardly ever heard the N81 on more than 80% of the volume it is capable of, so in my eye that advantage for the others discussed above is gone. I tried listening to them on different devices, yet the N81 pairing came out trumps in all of them. Even when I had them connected to the laptop without tinkering with the controls much, I was missing the richness of the N81 + QC3 combo. They disappoint. I had imagined that they will be upto the N95 mark at least but sadly they failed to deliver. Nokia had made this mistake with the N91 and they have repeated it. They quality and volume is however good as compared to some of the other phones. I may be a little too harsh because they are not bad, actually pretty good, they just don’t fit my description of good or may be they do and I was probably looking for ‘awesome’. The N81 comes very close to beating the N91 and the iPod with the same headphones being used on all of them. Most people do not require the additional volume and if that is taken out, it is almost a tie. But since the N81 is a better overall phone and if I am in the market for a music device the N81 will do it for me. But you will need a good pair of heaphones additionally, the bundled ones are not capable of matching the N81’s power. If you can spare the money, do yourself a favour and get the Bose QC3, it will guarantee musical bliss! Awww can’t wait to get them here! 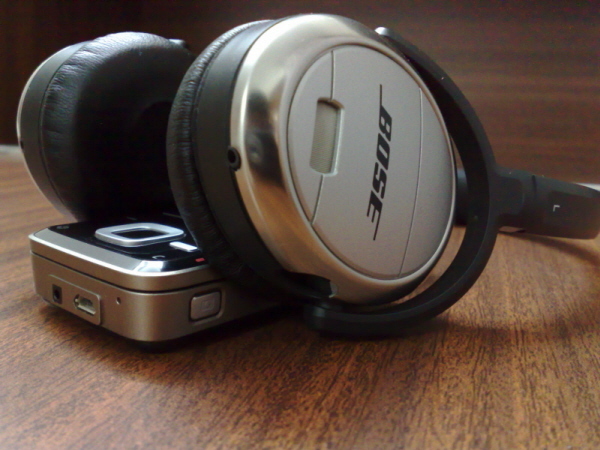 I hve gt to listen music on the quiet comfort 3 headphns….!!! thnks to Nokia too…da noise cancellation and the music experience really helped us in working better and faster…!!! Very interesting! Can’t wait to have the rumored N96 come out and see what you think of its music capability!